A healthy tummy is a cancer-free one and much attention has been given to the incidence of stomach cancer in adults of all ages. Unfortunately, stomach cancer has strangely been on the rise – and significantly so – in young, white adults. This has puzzled researchers in particular because the rates in other adults have actually been declining. The next question is – why might this increase in young adults be occurring? The odds of a person suffering from stomach cancer are still overall relatively low for adults. The incidence in the twenty-five to thirty-nine year old white group, however, has risen enormously over the last thirty years. In fact, it has gone up nearly seventy percent, causing major worry as to why this is the case, particularly when other groups are showing declining rates of stomach cancer. Researchers took a look at new cases of stomach cancer from the late 1970s to 2006. These specific cases involved cancer of the lower stomach. This type of cancer can result from a chronic infection relating to a very common kind of bacteria known to cause stomach ulcers in people of all ages. Lower stomach cancer has been connected with certain types of dietary patterns. These include diets that are very high in salty foods or foods that are preserved in salt. Another link is to diets that are quite low in healthy foods such as fresh fruits and vegetables. In places such as Asia, for instance, high-salt food preservation is often used and the incidence of lower stomach cancer is higher. When we look at the overall rates of stomach cancer though, they have been going down in a number of countries. This relates to better food preservation techniques and also improved hygiene. Both of these practices help to lower the risk of the bacterial infection mentioned above. Overall, salt intake has been on the rise in adults of all ages, which does not explain the increase of stomach cancer in young, white adults. Researchers are now investigating what, if any, dietary patterns in this particular group might be responsible for such a significant increase in the incidence of stomach cancer. The specific bacteria could be more prevalent in young adults or it could be yet another kind of bacteria that is contributing to the rising incidence of stomach cancer. Researchers still have many questions about these unknowns and additional studies are underway to learn about any additional contributing factors. 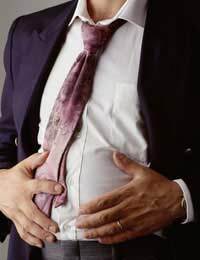 Stomach cancer remains a major issue due to its significant effects on those who suffer from the debilitating disease and eventually die from the disease. Finding out the reasons for its occurrence remains important in helping to put into place preventative strategies to protect those groups that are especially vulnerable to the disease. Hopefully, we can learn more about why young, white adults are suffering from stomach cancer at alarming rates.